Our kids had so much fun with THEIR Blankz Toy HERE. Now, it is your chance to win one for your child (or for yourself). I joined, I like also the ele-faint! Thanks for the giveaway! Poor blank toys from all white to colorful. really nice for kids who like to color. I think my boys would love the bloink. So cute! The Ele-faint is too cute! I like the ele-faint! Thanks so much for the fantastic giveaway! The ele-faint is the one I know my daughter would love! I love the pig! But I know my daughter would probably choose the elephant! I would like the elephant. How cute I'd love the elephant! Their No Bully is awesome! the white hound =) thanks! 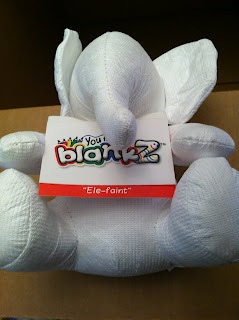 blankZ® Ele-Faint Set would be the one my daughter would love! I like the Hare, its too cute! White Hound is our favorite.. I love blankZ White Hound Set. I like the Un-Sealed Blankz! I would love the blankZ White Hound Set. I really like Ele-Faint out of all of them. I just love those big ears! Ele Faint is so cute! I like the elephant one. I would choose the White Hound.